Discussion in 'Online Games - News and Reviews' started by Marina, Jan 2, 2014. Fruit never looked so good! Enjoy playing Fruitilicious™, an eye catching video slot from Errel by JVH Gaming. JVH Gaming BV, have been sold to Austria's Casino Game Provider Novomatic. With stunning graphics and sounds, this plain and simple video slot is aimed to please. The video slot is a simple, basic slot game. There are no Scatters, no bonus rounds no wilds or anything special. you can win in any direction, as long as you have 3 or more of the same matching symbols on a winning payline. Win left to right, right to left or in the middle of any winning payline. 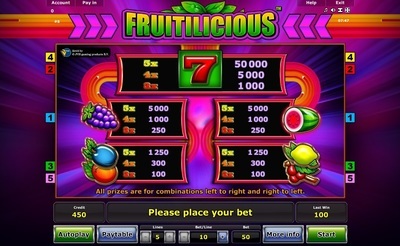 Fruitilicious™ is a 5 payline video slot, with 5 reels and 3 rows. Players can choose the amount of their bet per spin. The number of lines played are fixed at 5 lines. your winnings. Do you risk your winnings or gamble to double it? fruit. Novomatic video slots are known for throwing in other symbols and numbers in their fruit games. Your goal is to achieve 5 of the same symbols in a winning payline to receive the most winnings. winning combinations are plentiful and it's nice to play a video slot without all the bells and whistles. The Fruitilicious™ Slot looks really nice! I cant wait to try out this one. The Online Slot Fruitilicious is now online at StarGames!